“No man is an Iland. . . .
Unnoticed, in our gynocentric world, the rate of men taking their own lives has dramatically accelerated in the last half of a century. Suicide is now the single most common cause of death for active duty service men; there are now over 38,000 suicides in the U.S. each year, and, of those 38,000, 30,400 victims are men; 83 men commit suicide every day; men commit suicide at 4 times the rate of women. The rate of men being afflicted more than women has been increasing in the past 14 years, and, the rate at which men commit suicide, more than women, has been skyrocketing in the past ten years. The fact that these tragic suicides of Men goes unnoticed in the media provides us with a strong indicator of the cause of men leaving us through suicide. Why Are Men Committing Suicide? Most people, and institutions in our culture just don’t care than men are committing suicide. Our culture has become so misandrist (hateful of men), and so gynocentric (centered on pleasing women) that institutional misandry in universities, government, religion and the media compels us to ignore the fact that men, as a group, are suffering tremendously in our culture from gender oppression. This “gender oppression” arose from relentless feminist influence on our institutions over the past 50 years. At first, that feminist influence appeared to be benign. Feminism pretended for five decades to be a movement towards “equality” between men and women. Feminism, however, was a disguised movement to provide women with massive privileges, at the expense of men. This has lead to an almost habitual discrimination against men in our culture, and in our institutions. This discrimination and hatred of men is only recently coming to light. The extent of this discrimination against men has become so extreme, that only now can we begin to get a glimpse of the design of how our institutions are knowingly, and purposefully, trying to use “passive-aggressive” means of eliminating men in larger and larger numbers. 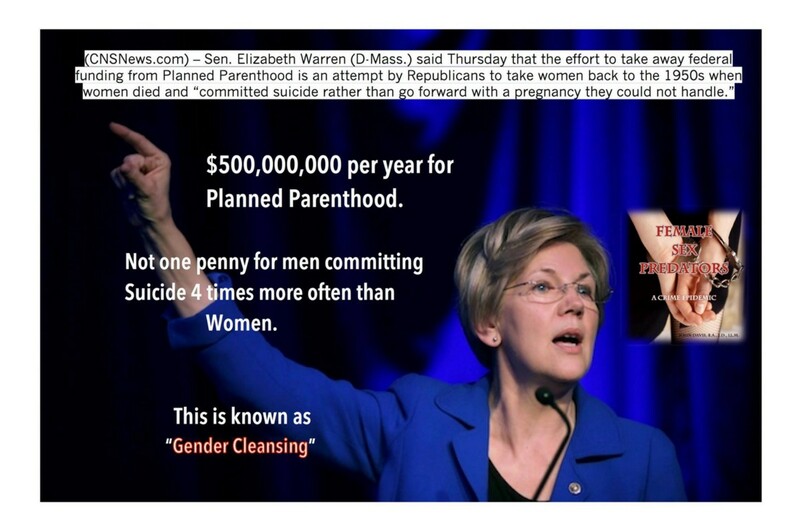 Sen. Elizabeth Warren (D. Mass) is the leading spokeswoman proclaiming (and admitting) that the half billion dollars spent on Planned Parenthood is primarily for the benefit of Women’s Health (but not inclusive of men’s health issues). A vote today to defund Planned Parenthood is not a vote to defund abortions. It’s a vote to defund cancer screenings, and birth control, and basic healthcare for millions of women. 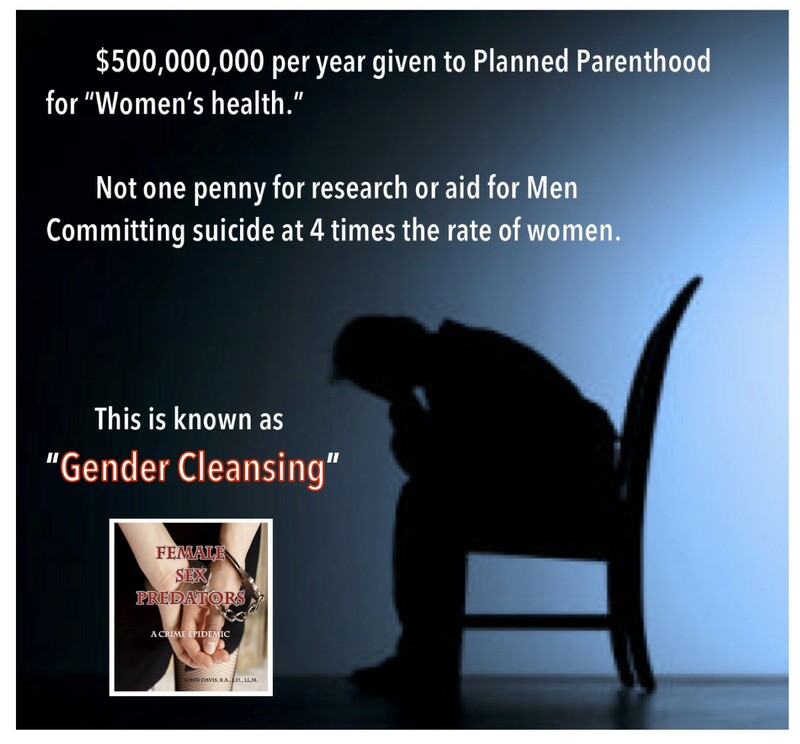 Is feminism Driving Gender Cleansing of Men? Sen. Warren and her followers are ardent feminists. Does that mean that they are seeking “equality” between men and women, or, does that mean they have declared war on men and masculinity? Our corporate controlled media has, for decades, portrayed feminism as a benign movement for equality between men and women. However, an examination of the true roots of feminism shows that it may very well be an intentional war on men, and masculinity; it may very well be a deadly war in which the objective is to cleanse our modern industrialized populations of both men, and masculinity. One way to advance a war against men, and masculinity, is to promote the death of men through suicide, and passively-aggressively denying aid to men who are suicidal. Denying a fair amount of government funds to prevent men from committing suicide, and, fostering gynocentric programs that, arguably, are partly the cause of men committing suicide, may very well be an intentional plan on the part of feminist lobbies, and, the politicians, industries and media who gain from serving gynocentric powers. 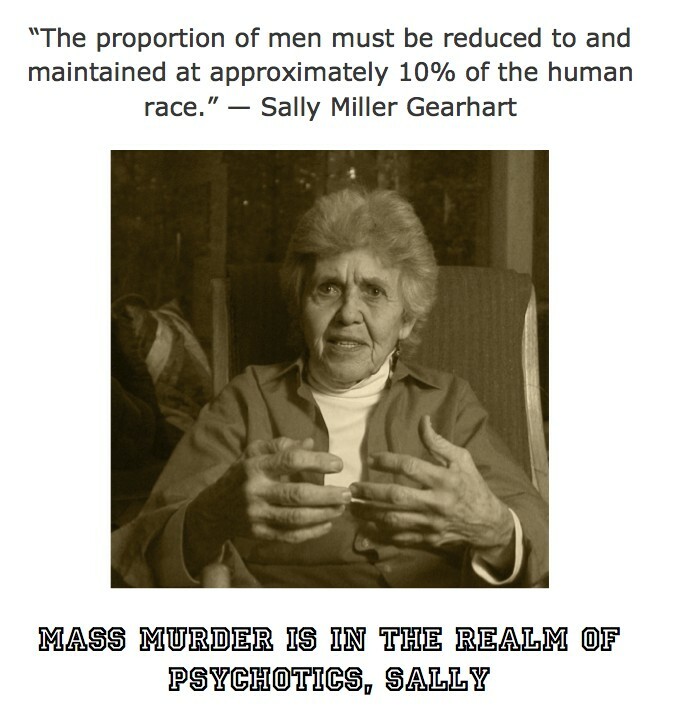 The concept of a deliberate (or at least a socially accepted) “conspiracy” to reduce the number of men in our culture is no less probable than the feminist accusation of a “patriarchal conspiracy.” From first wave feminism to the present, feminism has accused men of actively conspiring to suppress women’s rights, keep women in subservient roles, deny women access to men’s “privileges,” and deny women “equal opportunities” in all areas of our culture. Yet, many people find it implausible that feminists, in conjunction with the self-seekers who support them for economic or political benefits, are deliberately orchestrating a means of eliminating men from our culture much as a beehive purges itself of male bees just before winter. As feminism has gained power in the corporate media, government, education and other institutions, it has succeeded in increasing the disposability of men. Men fought wars for human freedom; men labored at great personal cost to physically build our infrastructure; men devoted their lives to the development of arts, science and philosophies that serve humanity; men gave their lives to fight for decent wages, decent working conditions, and they fought, at great expense to their health and longevity, to raise the standard of living for every human on the planet. Now that men have built modern civilization, they seem to be “irrelevant” to those who want to enjoy the benefits of that civilization without shouldering the burdens of its creation. If there is a deliberate tolerance of such policies, or, even an unaware indifference to such policies, it is sufficient to be one of the principal macro-causes of men committing suicide. Hatred of Men has become an obsession with feminism and the institutions (media, government and education) that support feminism. Hatred of Men (misandry) has risen in intensity over the past 50 years to the point in which it is considered an acceptable and encouraged aspect of our culture. In the name of political correctness the organized and corporatized media in our culture has emphasized, relentlessly, that men are nothing more than buffoons (and especially through their sexuality and feelings) are nothing more than nuisances to those who are currently in power. In other words, men are disposable. This organized and deliberate campaign to demonize men, their sexuality, their values, their history, and every incentive that Men have to participate in our culture, can have no other effect than to completely demoralize Men, and, drive Men into despondency over their natural birthrights. This organized campaign to demonize and demoralize Men, because of their animus and gender differences, seems aimed (either recklessly or deliberately) at the most vulnerable among us. Suicide is rarely a matter of “choice” or a rational decision. Although Men in desperate circumstances have sometimes committed suicide as a rational act (suicide was common in warrior cultures such as the Samurai culture in Japan, and, among warriors in Ancient Rome), modern suicide by men is almost exclusively an act of hopelessness, despondency and despair that is part of clinical depression. In future articles in this series we will explore some of the specifics of clinical depression as it affects Men, and, how misandry promotes clinical depression in men. We’ll also explore some of the aspects of our culture, and its open hatred of men, that causes men who are vulnerable to clinical depression to commit suicide. Finally, we’ll try in future articles to advance some solutions to the problem of Men leaving us through suicide. Bacheloris Artis, Case Western Reserve University 1975; Juris Doctor, Seattle University School of Law 1981; Legis Magister, New York University School of Law 1984. See generally, Nathanson, Paul & Young, Katherine, Spreading Misandry: The Teaching of Contempt for Men in Popular Culture, McGill-Queen’s University Press, 2d. Ed., 2006; Nathanson, Paul & Young, Katherine, Legalizing Misandry: From Public Shame to Systemic Discrimination Against Men, McGill-Queen’s University Press, 2006; Nathanson, Paul & Young, Katherine, Replacing Misandry: A Revolutionary History of Men, McGill-Queen’s University Press, 2015.
 animus, animi, noun, L. declension: 2nd declension gender: masculine. Definitions: male air, male feelings, male heart, male intellect, male mind, male soul, male spirit, courage, character, pride. Oxford Latin Dictionary, 1982. John Davis is a retired public official and international lawyer and writes on current gender issues. He is the Editor of Gender Studies for Men.